At least 37 people have died after a fire at a psychiatric institution on Friday morning outside the central Russian city of Veliky Novgorod, according to investigative officials. Russia’s Investigative Committee has opened a criminal case to discover the cause of the fire even as hundreds of emergency workers continue to work at the scene. An earlier statement from the Emergencies Ministry said that 23 people had been saved. “According to refined data, there were about 60 people inside. More than 20 were evacuated by the facility’s administration,” the Head of Russia’s Emergencies Ministry Oleg Voronov was quoted by local media as saying. 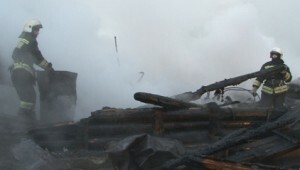 The fire occurred in the village of Luka at the Oksochi Psychoneurological Institution. This type of facility is common across Russia and houses elderly people unable to look after themselves, the mentally ill and the chronically institutionalised. The incident is the latest in a series of fires at psychiatric institutions across Russia this year, despite efforts by authorities to improve fire safety at the facilities. In a similar tragedy in April this year a blaze in the town of Ramensky north of Moscow killed 38 at a psychiatric hospital. Two more fires took place in May at psychiatric institutions in Russia’s central Tambov Region and in the southern Krasnodar Region.